You probably know by now that we love searching the Lowe's clearance section for deals (especially appliances) but that isn't the only place we search. One kitchen item we had basically decided we were going to have to pay almost full price for was a wall oven. We had been searching and searching for a good deal on one but the best we could find was a couple marked down a couple of hundred dollars. This meant that we would still be spending over 2 grand for a wall oven and I just have a hard time paying that much for really anything. So, we turned to our second favorite place to search for deals... Craigslist. We've had to adjust how we use Craigslist in Fl since good things aren't as abundant as they are up near Boston and all the good things go really fast. 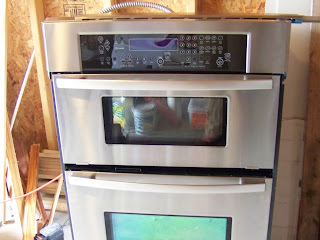 We started checking Craigslist fairly regularly for a deal on a wall oven and finally found this one.... for 500 bucks. Craigslist can be overwhelming so here are a few tips for getting an awesome deal. Look up specs on the product. This lets you weed out bad sellers as well. A good Craigslist seller should list a lot of information about the product or be willing to send you additional information. If they aren't willing, that makes me think they are hiding something. By looking up the specs, you can see how much the msrp is for the product as well as reviews so you can see if the seller is trying to sell something at an unreasonable price or of the reason it's being sold is because it breaks after 2 months. For our oven, I was able to see that it hit all the things off our checklist and was an almost $3000 oven and had great reviews. Ask why it is being sold. It is a simple question that should be easily answered. If you don't like the answer, don't get it. By asking this, we found out the oven was brand new and was in a model house. Florida has a ton of model homes that are not selling so the builder's are selling off the appliances to get some of their money back. The guy we bought this from is an appliance repair guy and was able to buy appliances in an auction from a bunch of houses and has been selling the individual pieces. We were reassured by the fact that it had never been used but was all hooked up so it worked (plus the guy told us if anything didn't work he'd fix it). Act quickly and negotiate. The previous 3 steps may seem like a lot but they can be done in a matter of minutes. If you still want to go ahead and try to get the product, call the person right away and tell them you are interested and ask if it is still available. If it is, negotiate. For our oven, initially the seller was offering to sell it for $700. We asked if he would accept $500 if we paid cash and picked it up right away. We expected something in between but we got lucky and he took it. Cash and a fast pickup (basically ensuring a sale) can be a real motivator. Check out the neighborhood and bring a buddy. This may seem silly, but picking up things from Craigslist actually freaks me out a bit. I refuse to pick up anything by myself and really don't like Nate going by himself either so we usually go together and we check out the neighborhood a bit. If our gut tells us something doesn't feel right (which actually hasn't happend with any Craigslist purchases but has with some yard sales) we are willing to let the item go. While the majority of people are great and honest and not at all creepy, I don't trust that 100% of the people selling on Craigslist fit that category and it really isn't a deal if you aren't safe. These are the steps we go through to make sure we are happy with a purchase off of Craigslist. This wall oven is probably our best find (especially because the top is a microwave!) and we are so happy with it. We are also happy that it checks 2 more appliances off our list. To see all our other kitchen appliance purchases, click on the links below. Our original budget for appliances was $6500 but to this date we've only spent about $2500 so it really pays to wait for a good deal! Thanks for the great tips, and congratulations on your awesome find! That certainly is a great deal, and it looks beautiful! Found you on HOH. Thanks so much for sharing and good luck with your kitchen! I'm sure it will look GORGEOUS! Wow, you've found some really great deals! I'm realizing more and more that my husband & I haven't been working hard enough to find the best price - it's so worth it! Popped over from House of Hepworths!